Xconomy: Intuit Goes All Out to Solve the Innovator’s Dilemma. Is It Working? Intuit Goes All Out to Solve the Innovator’s Dilemma. Is It Working? Technology writers gravitate to early-stage startups for roughly the same reason that Willie Sutton robbed banks: because that’s where the money is. Or at least, where it could be if the founders get everything right. We love the brash, young CEOs who are out to disrupt entire industries—in no small part because they’re usually happy to talk to reporters. The pattern has been thoroughly documented. Once a company is mature enough to have lots of well-paying customers, it starts having trouble imagining how it might serve those customers in new ways. Innovative product ideas that could undermine existing revenue streams get squashed, and promising new technologies go unexploited. Eventually, newcomers move in and take over the market, the way Salesforce.com ate Siebel’s lunch in the CRM business, or the way Apple and Google are currently destroying Nokia in the mobile business. Harvard Business School professor Clayton Christensen spelled it all out in 1997 in The Innovator’s Dilemma, a book that’s become gospel inside companies both large and small for its study of how established companies get disrupted by new technologies and business models. But understanding the problem doesn’t make it any easier to solve. A case in point: Intuit (NASDAQ: INTU). Next year, the Mountain View, CA-based maker of financial software for consumers and small businesses will turn 30 years old. For a company its age, Intuit has done as much as any other Silicon Valley outfit I can name to foster an innovation-friendly culture within its walls and to bring in fresh outside talent when necessary—witness its shrewd 2009 acquisition of Mint.com. But no giant payoff has yet arrived. Make no mistake—Intuit is a solidly run company whose earnings have been rising steadily, from $477 million in 2008 to $792 million in fiscal 2012. Over the last half-decade, its stock has outperformed the S&P 500 by a factor of two, and this year the firm began paying cash dividends for the first time ever. Yes, Intuit successfully negotiated the transition from selling shrink-wrapped desktop software in the 1980s and 1990s to selling online services today. But it’s still in the midst of making the next big leap, to serving consumers and businesses on their mobile phones. And the company remains a relatively small player on the Silicon Valley stage: its market capitalization is a mere $18.2 billion, compared to Oracle’s $152 billion, Google’s $223 billion, or Apple’s $550 billion. Over the last few months I’ve been speaking with Intuit executives and current and former employees, trying to get a read on this interesting company and whether its numerous and earnest efforts to stay innovative—spearheaded largely by founder Scott Cook, CEO Brad Smith, and chief technology officer Tayloe Stansbury (pictured above)—have positioned the company for big successes in the future. The answers aren’t clear-cut. But the question is one that should concern the leaders of every tech company that’s past the startup stage. If, after trying every trick in the book, Cook and his colleagues still can’t find ways to bring out startling new products, win new fans, and compete with upstarts, then it’s a sure sign that disruptive innovation is the province of young companies like Square who have nothing to lose (except, of course, a few hundred million in venture cash). 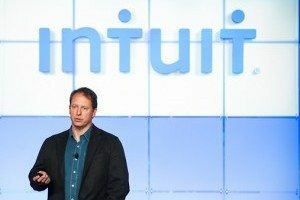 Many of the people I talked to inside Intuit, from Mint.com founder Aaron Patzer to the creators of the new SnapTax mobile app, believe the company is still very much in the game—and that it’s learning how to generate and refine ideas faster and simplify its existing products for the era of smartphones and tablets. Yet in the one market niche that Intuit should arguably have owned from the beginning—mobile payment processing for small businesses—it’s been lapped by upstart Square. The Goths, in other words, are banging at the gate. From the beginning, Intuit has had one giant truth working in its favor. People hate managing their money. Balancing a checkbook, paying taxes, understanding basic double-entry bookkeeping for a small business, making payroll—it’s all a huge pain. Yet it’s also emotionally fraught, given that our worries about money are hard to untangle from our feelings about power, freedom, and obligation.